Alleged Gorkha Janmukti Morcha supporters engaged in a pitched battle with security personnel at two different spots here today, leaving six uniformed persons and three members of the mob injured. This was the first clash between Gorkhaland supporters and the police in Kalimpong district since the latest round of the unrest began in the hills in early June. The district, however, had witnessed numerous incidents of arson and vandalism in the past three weeks. The trouble began when Yuva Morcha, the youth wing of the Morcha, took out a massive march from Damber Chowk around 11am with many of the youths openly wielding khukris. As a section of the rallyists reached a six-storied building which also houses the office of the Trinamul Congress at R. C. Mintri Road, some in the group first started hurling stones at a group of police personnel posted in the front of the structure. They also torched two shops located on the third floor of the building. Within minutes, the reinforcement, including those from the State Armed Police, led by Ajit Singh Yadav, the superintendent of police, Kalimpong, reached the spot and cordoned off the area. "Police engaged themselves in putting off the fire. Soon, some local people also joined in the exercise. However, fire engines could not reach the spot as Morcha supporters allegedly prevented it from going there," said a source. Even as the blaze was being doused, a massive mob of Morcha supporters came rushing along Rishi Road, which runs parallel to R.C. Mintri but is on a higher gradient, and started pelting the police personnel below with stones. Police fired tear gas cells to disperse the mob. "However, they remained undeterred and continued raining stones, taking advantage of the vantage point it enjoyed. This continued for about an hour," said the source. On June 8, police had been attacked by protesters who took vantage points in Darjeeling when chief minister Mamata Banerjee was holding a cabinet meeting. Even as the R.C. Mintri Road incident was being played out, another mob set on fire the office of the North Bengal State Transport Corporation located at Motor Stand, about 1km away. Eyewitnesses said as a posse of policemen reached Motor Stand, the crowd dispersed and some of them gathered at Damber Chowk, a furlong away. "A little later, another mob appeared and started hurling stones at police personnel. The police then fired in the air and lobbed rubber bullets at the mob," said an eyewitness. The police said six persons were injured in the clashes. Morcha sources, on their part, said three of their supporters had also received injuries. "Six (policemen) have been injured, four of whom have been hospitalised. One of them has received injuries from khukri...Two others were administered first aid and are fine now," said the Kalimpong SP. Ramesh Allay, a senior Morcha leader, said three party supporters, too, had been injured in the day's incidents, and accused the police of using live bullets. "We have evidence to prove that the police used live bullets, and not rubber bullets," he said. The Kalimpong police superintendent, Yadav, denied using anything other than rubber bullets. "We fired non-lethal gas gun...rubbers bullets are fired from gas gun," he said. 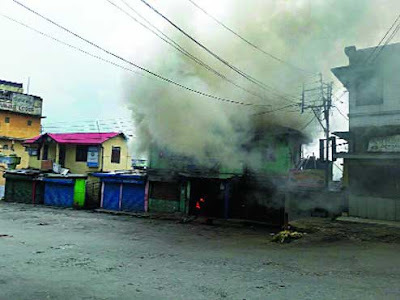 Shops & NBSTC office torched in Kalimpong - Alleged Gorkha Janmukti Morcha supporters engaged in a pitched battle with security personnel at two different spots here today, leaving six uniformed persons and three members of the mob injured.